So, here we are, you and I, together again for a few minutes. I’m so glad you found me! I really had been worried that you wouldn’t find me. After all, my old blog was waaaaaaay over there on the other side of the internet, and traffic can be terrible. Since you’re here, this is kind of the perfect opportunity to share with you why someone who LOVES to travel HATES to move. 1. Boxes, Dust, and Finally Seeing What’s Been Growing Behind The Fridge. My sister moved last week. Just hearing about movers and trucks and uprooting and disconnecting made me feel all clenchy and squeezy inside. However, her new postal code ends with 0B1. Yes, young Jedi, 0-B-1. That alone might have made the entire hullaballoo worthwhile. What’s the very worst thing about living abroad? It’s not the giant bugs or the weird green jelly in the bread, or even the corn on the pizza. It’s saying Goodbye. To everyone. All the time. You say it to your friends and family at home when you leave, and to your friends-like-family here when they leave. And people in expat communities are always leaving. In my world, one person doesn’t just move to the other side of town. No, around here, ALL THE PEOPLE eventually move to ALL THE EVERYWHERE. To all the other sides of the whole planet. And when they do, they leave holes in my life that come in odd shapes and sizes. For years, we’ve regularly shared life and laughter and (most importantly!) brunch. Now, they’re on the other side of the whole planet and I have a new hole in my life. This particular hole is shaped like a blueberry pancake. Do you know how hard it is to find new friends to fill such oddly specific shaped gaps in your life? Do you? Of course you do. You know it’s impossible. So there you have it. The very worst part of living abroad is going through life with holes in your heart shaped like pancakes and zebras and yoghurt tarts and knitting needles and tea cups all the little things that make the people in your life worth knowing. In the end though, having the privilege of sharing a slice of life with such precious people makes it all worthwhile – just like a new widget on the blog or a Star Wars postal code. 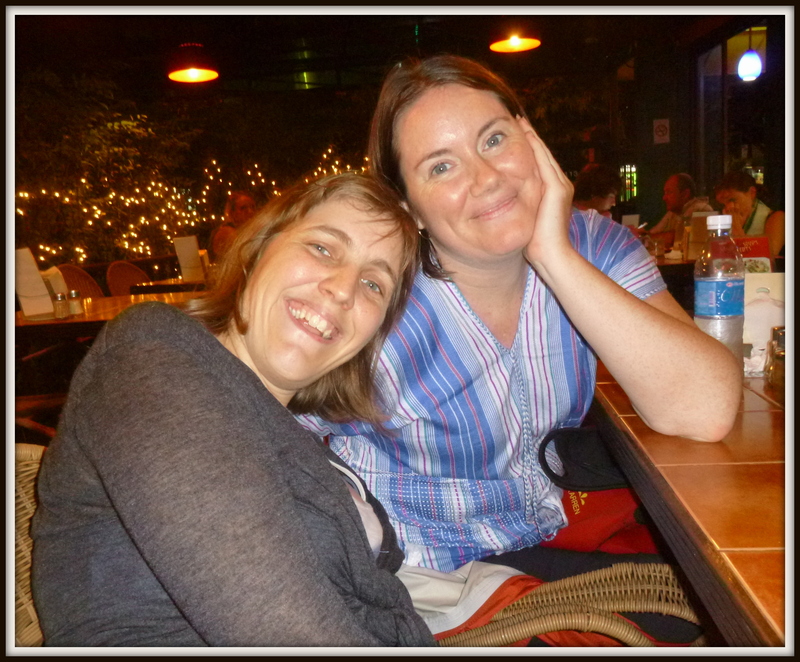 This entry was posted in Everyday Life Abroad, General Musings, Thailand and tagged brunch, moving by Janice Hillmer. Bookmark the permalink. I take it back. After I saw your lovely house, I knew it was worth the ninja ants! And look at you getting all reflective and deep like you said you never do! New approaches for new (virtual) homes. Kathy, I’m glad you approve! =) Have a safe flight, and come visit again soon, please. I never enjoyed moving. Funny though, once I get to the new, it always turns out just fine and a new adventure begins! Congrats on the virtual move! The new site looks lovely! And I can totally relate to hating moving. Especially watching friends moving when you’re an expat. It’s one of the things that makes me hesitate about going overseas again. That and the fact that I would actually have to move. Uggh. My least favorite part of moving is trying to fit all our old furniture and belongings into new spaces. My favorite part is searching out new places – a good local butcher shop, or a specialty cheese shop, or a new park/playground for the kids. The “K” is a hangover from acronyms like “MK” and “PK” – “missionary kid” and “pastor’s kid”. No reflection on age or maturity… 🙂 And yes, when you come back to Canada, you are going to find adjusting a challenge. I highly recommend a series called China Beach. It’s about a nurse who serves in Vietnam, and at first it seems like it might just be MASH in Vietnam, but it is so much more than that, and in the end is pretty hard hitting. The episodes after her tours are over and she comes back to the US are ones that anyone who has lived overseas would understand. Now her situation is complicated by the trauma she witnessed, but very often those who have lived in other cultures may be dealing with some of that, due to having witnessed accidents or violence, depending on where they lived. It’s based on a book called “Home by Morning” which biographical in nature, written by a nurse who served in Vietnam. That book is on my bucket list. The nurse herself died I believe in the 90’s due to complications resulting from exposure to agent orange. Which is another kind of thing those who have lived in the developing world may have to deal with, whether its the long term effects of tropical illnesses, or exposure to dangerous chemicals which are banned in Western developed nations. Anyway, as you can imagine, we had some pretty interesting discussions in our little TCK group. Thanks, Owen. I’ll look into that series. =) Over the years, I’ve read quite a bit about culture shock, but not so much about reverse culture shock. I know it’s out there, but so far I haven’t needed it. Maybe now’s the time. – Home will be the same, but you have changed profoundly. The country you left may feel more like “home” than your true home does. – The things that people talk about here, that once seemed so important, will seem meaningless and annoying – who the f*** cares what whosit did on American Idol last night? And that might be combined with what I call “Russian Spy Syndrome”, where you look and sound like everyone else, but people will talk about cultural things, again that they seem to think are so vitally important, and you won’t have a clue what they are talking about. – Because you’ve seen so many people come and go in your life you may find it difficult to allow anyone to get truly close to you. If you are like me, a certain level of intimacy will come very quickly and easily, but there will be a line you won’t want anyone to cross, because you’ve learned that everyone says goodbye eventually, and it just hurts too much to say goodbye to people you’ve allowed to become that important to you. – Your tastes have changed, and an awful lot of things you used to enjoy immensely may now seem flat, stale, and boring to you. You should be aware that this is also a symptom of depression, which may also be an issue. Anyway, I’m not trying to bring you down with this information, just make you aware of what you may face when you come back “home”. – Seek new experiences. Check out that new Indian restaurant just down the block. Go for a one week hiking trip in Albert county or in Fundy park. Visit Montreal, check out some jazz clubs and slaughter your arteries with a real Quebecois poutine, or a real Montreal smoked meat sandwich. – Look for activities that are genuine, and not “touristy”. – Be open and honest and resist the impulse to push people away, even if they don’t seem to understand where you are coming from. – Accept people you meet at “home” the way you find them. They may seem narrow minded, or “provincial”, and what they seem to care deeply about may seem unimportant or frivolous, but when you look beyond that, you will find that their lives are far more interesting than their everyday chatter and small talk might seem to indicate that they are. – Seek out other people who don’t seem to “fit in”. Your new perspective opens up the opportunity to meet and become close to some really interesting people that you might not have been able to relate to when you were younger. Just be careful when you do that though. Very often people that are marginalized or living on the fringes are there because of mental health issues that require that you maintain a certain level of objectivity in your relationships with them, and you may have to resist the impulse to try to “rescue” them. Miss you lots, Owen. There’s an Owen-shaped hole in my life that looks like a coffee cup with a little black notebook with red corners beside it. Sending you a long-distance hug from a hemisphere away.